Waves Ltd. have just released their latest piano plugin which features the Fazioli F228 from London’s Metropolis Studios. They’ve called it the Grand Rhapsody Piano. The Fazioli is a superb, hand-crafted piano, but one of the more interesting attributes to this particular F228 is its appearance on Adele’s “Hello” (and other tracks from her Grammy Award winning album “25” album). Founded in 1981, Fazioli produce six models of grand piano. They range from the immensely powerful F308 concert grand (308 is its length in centimetres), down to the F156 baby grand. The F228 sits in the middle of the pack and is classed as a medium (or semi-concert) grand. In the studio, a medium grand is generally used when the piano isn’t intended to be the focus of the recording. US-Israeli company, Waves Ltd, were are of the pioneers of audio software. The company began trading in 1990, and currently their catalogue includes around 60 audio products (both hard- and software). The main screen for Waves’ Grand Rhapsody Piano. Click image to see the controls more clearly. 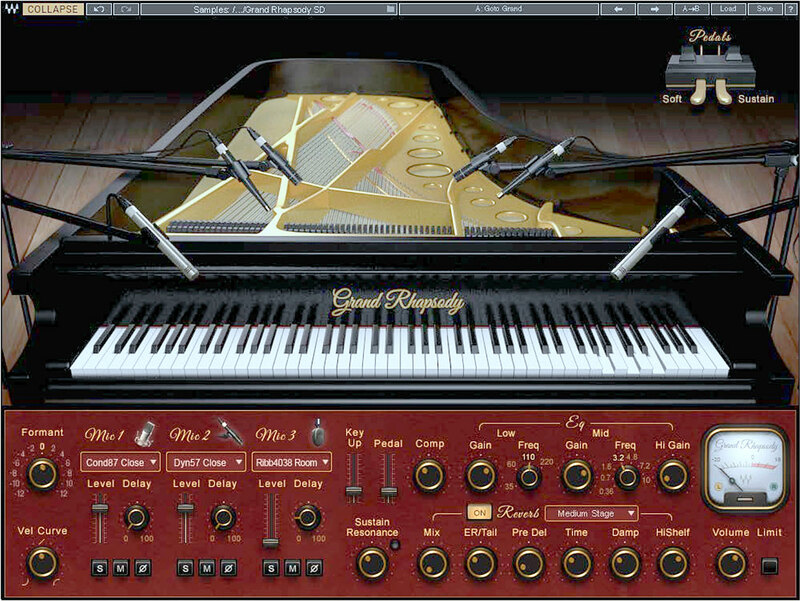 The Grand Rhapsody Piano works both as a plugin, and as a standalone. Waves’ engineers sampled Metropolis’ F228 using 8 pairs of microphones. Three of the microphone-pairs can be active at any one time, and mixed as desired. The software also includes a range of other modifiers (reverb, e.q., limiters, etc.). The Waves Grand Rhapsody costs just 29 US dollars – a saving of 159,971 USD on a Fazioli F228 – and you don’t have to tune it. But Christian Grey (50 Shades…) had a real Fazioli in his apartment! The users manual for the Grand Rhapsody Piano can be found here and is a helpful introduction to the workings of the software. I bought it and thought it was great until I had to deal with their “customer service”. That ruined the whole experience for me. I wanted to mixdown to a super hi-fi quality, but it wouldn’t le me do it. After trying to talk to them they refused to offer me any options other than, “Your DAW isn’t recommended”. I use Mixcraft 8. But, PianoTeq, Pianissimo, and East West Pianos all mix down to studio quality hi-fi; 96K Hz, 24-bit.